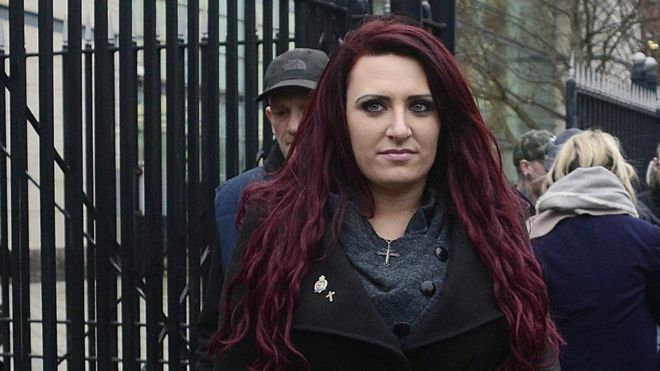 “The deputy leader of far-right group Britain First, Jayda Fransen, will go on trial in April on charges connected with alleged hate speeches in Belfast. She is accused of using threatening, abusive or insulting words during a protest in the city on 6 August 2017. The 31 year old, from Anerly, London, denies the charges. The offences are alleged to have taken place at a “Northern Ireland Against Terrorism” rally which was held outside Belfast City Hall. The demonstration was organised on the same day as Irish republican [Catholic] protesters held a march in Belfast to mark the anniversary of internment – detention without trial [of suspected Catholic terrorists] – during the Troubles in Northern Ireland. Ms Fransen is accused of two counts of behaviour intended to or likely to stir up hatred [between Protestant and Catholic Christians] in connection with her attendance at that rally. Separately, she is also being prosecuted over allegations that she incited racial hatred by making anti-Islamic remarks at a Belfast peace wall on 13 December 2017. Those charges – which were also before the court on Tuesday – include using threatening language or behaviour with intent to stir up hatred or provoke a breach of the peace, and sending menacing or grossly offensive messages by a public electronic communications network. Ms Fransen made no comment during the brief hearing in Belfast. However, a defence barrister told the judge his client is pleading not guilty to both sets of charges. The date for her trial over the Northern Ireland Against Terrorism rally comments was set for 6 April 2018. A trial date for the peace wall comments is expected to be decided upon at a further hearing on 26 January.